The Battle of Belleau Wood (1–26 June 1918) occurred during the German Spring Offensive in World War I, near the Marne River in France. 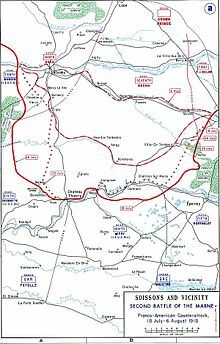 The battle was fought between the U.S. 2nd (under the command of Major General Omar Bundy) and 3rd Divisions along with French and British forces against an assortment of German units including elements from the 237th, 10th, 197th, 87th, and 28th Divisions. The battle has become a key component of the lore of the United States Marine Corps. U.S. Marines in Belleau Wood (1918). Location of U.S. Marine forces in Belleau Wood and surrounding areas, 6 June 1918. On the night of 4 June, the intelligence officer for the 6th Marines, Lieutenant William A. Eddy, and two men stole through German lines to gather information about German forces. They gathered valuable information showing the Germans were consolidating machine gun positions and bringing in artillery. While this activity indicated an attack was not immediately likely, their increasing strength was creating a base of attack that raised concern about breaking through to Paris. Overall, the woods were attacked by the Marines a total of six times before they could successfully expel the Germans. They fought off parts of five divisions of Germans, often reduced to using only their bayonets or fists in hand-to-hand combat. On 26 June, the 3rd Battalion, 5th Marines, under command of Major Maurice E. Shearer, supported by two companies of the 4th Machine Gun Battalion and the 15th Company of the 6th Machine Gun Battalion, made an attack on Belleau Wood, which finally cleared that forest of Germans. On that day, Major Shearer submitted a report simply stating, "Woods now U.S. Marine Corps entirely",(p3) ending one of the bloodiest and most ferocious battles U.S. forces would fight in the war. United States forces suffered 9,777 casualties, included 1,811 killed. (p32) Many are buried in the nearby Aisne-Marne American Cemetery. There is no clear information on the number of German soldiers killed, although 1,600 were taken prisoner. 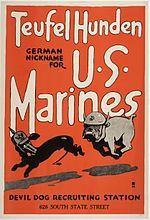 Legend and lore has it that the Germans used the term "Teufelshunde" ("devil dogs") for the Marines. However, this has not been confirmed, as the term was not commonly known in contemporary German. The closest common German term would be "Höllenhunde" which means "hellhound". Regardless of the term's origin, ten years after the battle, Lieutenant Colonel Ernst Otto, from the Historical Section of the German Army, wrote of the Marine Corps; "Their fiery advance and great tenacity were well recognized by their opponents." Marines actively serving in the Fifth and Sixth Marine regiments are authorized to wear the French Fourragère on the left shoulder of their uniform to recognize the legacy and valor of their regimental predecessors. In June 1923, the Marine Band performed a new march called "Belleau Wood" for the first time during the annual Belleau Wood Anniversary celebration. Composed by then Second Leader Taylor Branson, who would later lead the Marine Band from 1927 to 1940, it was dedicated to Army Major General James. G. Harbord, who commanded the Marines during the battle. White crosses and Stars of David mark 2,289 graves, 250 for unknown service members, and the names of 1,060 missing men adorn the wall of a memorial chapel. Visitors also stop at the nearby German cemetery where 8,625 men are buried; 4,321 of them—3,847 unknown—rest in a common grave. 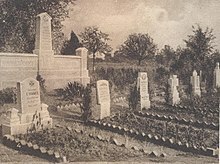 The German cemetery was established in March 1922, consolidating a number of temporary sites, and includes men killed between the Aisne and the Marne in 1918, along with 70 men who died in 1914 in the First Battle of the Marne. On 18 November 1955, a black marble monolith with a bronze relief of a fighting Marine was dedicated at a road clearing near the site of the battle. Simply entitled The Marine Memorial, it was sculpted by Felix de Weldon, the artist who had also sculpted the Marine Corps War Memorial in Washington, D.C. The memorial honors the 4th Marine Brigade for their bravery here in June 1918, and is the only memorial in Europe dedicated solely to the United States Marines. Below the statue is a commemorative plaque with a large Eagle, Globe, and Anchor. The plaque includes a brief history of the battle, with text in both English and French. Officiating at the monument's dedication ceremony was then Commandant of the Marine Corps, General Lemuel C. Shepherd, Jr., who had fought and was twice wounded at Belleau Wood, and later awarded the Army Distinguished Service Cross and the Navy Cross for his gallantry in action, 37 years earlier. In New York City, a 0.197 acres (800 m2) triangle at the intersection of 108 Street and 51st Avenue in Queens is dedicated to Marine Private William F. Moore, 47th Company, 2nd Battalion, 5th Marine Regiment. Two U.S. Navy vessels have been named for the battle. The first USS Belleau Wood (CVL-24) was a light aircraft carrier active during World War II in the Pacific Theater, from 1943 to 1945. From 1953 to 1960, she was loaned to the French Navy under the name Bois Belleau and served in the First Indochina and Algerian Wars. The second USS Belleau Wood (LHA-3) was active from 1977 to 2005. A shortened version of Lloyd Williams' famous quote is the basis for the motto the 2nd Battalion, 5th Marines, his unit during the battle. Williams himself has been honored with a building on the campus of his alma mater Virginia Polytechnic Institute and State University named in remembrance of him. In April 2018, French President Emmanuel Macron gifted the United States a sessile oak sapling from Belleau Wood as part of his state visit. On November 10th, 2018, amid ceremonies in the French capital to mark the 100th anniversary of the end of the first world war, a planned presidential visit by Donald Trump to the American cemetery at Belleau, a site of immense importance to the US military, was cancelled because low cloud cover prevented air transport. Also; on November 10, 2018 (Note: This day celebrates the 243rd Birthday of the United States Marine Corps) White House Chief of Staff, John Kelly and Chairman of the Joint Chiefs of Staff, General Joseph Dunford, USMC visited Aisne-Marne American Cemetery & Memorial. ^ a b c Stewart, Richard W., ed. (2005). The United States Army in a Global Era, 1917–2003. American Military History. Volume Two. Washington, D.C.: Center of Military History, United States Army. ^ "Château-Thierry: The Battle for Belleau Wood". The Great War Society. ^ a b c d e f g h i j k l m n o p q r Moskin, J. Robert (1992). The U.S. Marine Corps Story. Canada: Little, Brown and Company. ^ a b c Kozaryn, Linda (18 June 1998). "Marines' First Crucible: Belleau Wood". American Forces Press Service. ^ a b "Major Williams Hall - Virginia Tech". vt.edu. 27 November 2007. ^ a b Duffy, Michael (15 December 2002). "Battles: The Battle of Belleau Wood". First World War.com. ^ Catlin, Albertus W. (9 March 1919). "Straight to Deaths Marched the U.S. Marines, "With Heads Up and the Light of Battle in Their Eyes," says their Commander". The Sun. New York, NY. p. 67. Retrieved 18 January 2017. ^ a b c Curtis, Capt. Thomas J. (March 1919). History of the Sixth Machine Gun Battalion, Fourth Brigade, U.S. Marines, Second Division, And Its Participation in the Great War. Neuweid on the Rhine, Germany. ^ a b c McBreen, 1stLt B.B. (6 June 1994). "2nd Battalion 5th Marines at Belleau Wood" (PDF). 2d Battalion, 5th Marines. ^ Rickard, J (10 August 2007). "Battle of Belleau Wood, 6–26 June 1918". Retrieved 25 September 2008. ^ McCahill, William P. Hit the Beach! Your Marine Corps in Action. New York: W. H. Wise, 1948. OCLC 1825060 p. 18. Retrieved 26 June 2015. – via Questia (subscription required). ^ Historical committee, Second Division Association (1937). Spaulding, Oliver Lyman; Wright, John Womack (eds.). The Second Division American Expeditionary Force in France, 1917–1919, Volume 2, Part 4. The Hillman Press, Incorporated. p. 94. ^ "History of 5th Marine Regiment". 5th Marine Regiment, 1st Marine Division. United States Marine Corps. Retrieved 7 August 2015. ^ "Writes New March Called "Belleau Wood"". Leatherneck. Marine Corps Association. May 1923. Retrieved 7 August 2015. ^ "Address of Major General James G. Harbord, U. S. Army Dedication of "Belleau Wood" July 22nd, 1923". 2nd Division - Second to None. MG Ryder. Retrieved 1 December 2015. ^ Headquarters Marine Corps (2003). "Who's Who in Marine Corps History: Dr. Felix Weihs de Weldon". Retrieved 3 July 2008. ^ Shepherd, Jr., Gen Lemuel C. "Remarks at the Unveiling of Belleau Wood Memorial Plaque". Marine Corps Historical Documents, Orders and Speeches. United States Marine Corps Historical Division. Retrieved 6 August 2015. ^ CNN, Kate Bennett,. "Melania Trump prepares for first state dinner". CNN. Retrieved 22 April 2018. Spiva, Dave (July 2018). "Marines 'Punch Back' at Belleau Wood". VFW Magazine. Vol. 105 no. 9. Kansas City, Mo. : Veterans of Foreign Wars of the United States. pp. 34–35. ISSN 0161-8598. 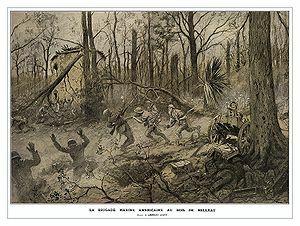 Wikimedia Commons has media related to Battle of Belleau Wood.